Diving cylinders are usually manufactured from aluminium or steel alloys, and are normally fitted with one of two common types of cylinder valve for filling and connection to the regulator. Other accessories such as manifolds, cylinder bands, protective nets and boots and carrying handles may be provided. Various configurations of harness may be used to carry the cylinder or cylinders while diving, depending on the application. Cylinders used for scuba typically have an internal volume (known as water capacity) of between 3 and 18 litres (0.11 and 0.64 cu ft) and a maximum working pressure rating from 184 to 300 bars (2,670 to 4,350 psi). Cylinders are also available in smaller sizes, such as 0.5, 1.5 and 2 litres, however these are often not used for breathing, instead being used for purposes such as inflation of surface marker buoys, drysuits and buoyancy compensators. 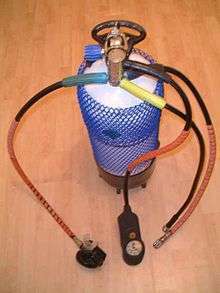 Scuba divers may dive with a single cylinder, a pair of connected similar cylinders, or a main cylinder and a smaller "pony" cylinder, carried on the diver's back or clipped onto the harness at the sides. For some diving, more that two cylinders may be needed. 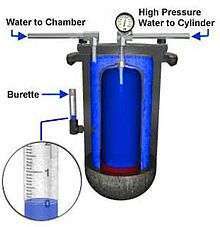 When pressurised, a cylinder carries an equivalent volume of free gas greater than its water capacity, because the gas is compressed up to several hundred times atmospheric pressure. 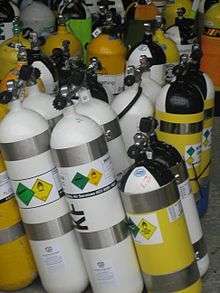 The selection of an appropriate set of diving cylinders for a diving operation is based on the amount of gas required to safely complete the dive. Diving cylinders are most commonly filled with air, but because the main components of air can cause problems when breathed underwater at higher ambient pressure, divers may choose to breathe from cylinders filled with mixtures of gases other than air. 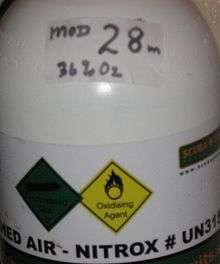 A cylinder containing such mixtures needs to be labelled to indicate its contents for safety reasons. 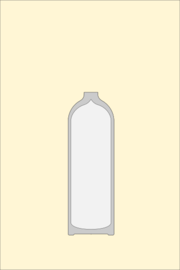 Many jurisdictions have regulations that govern the filling, recording of contents, and labelling for diving cylinders. Periodic inspection and testing of cylinders is often obligatory to ensure the safety of operators of filling stations. 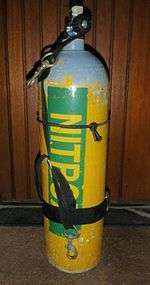 Pressurised diving cylinders are considered dangerous goods for commercial transportation, and regional and international rules for colouring and labelling may also apply. The term "diving cylinder" tends to be used by gas equipment engineers, manufacturers, support professionals, and divers speaking British English. "Scuba tank" or "diving tank" is more often used colloquially by non-professionals and native speakers of American English. 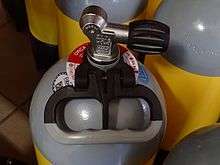 The term "oxygen tank" is commonly used by non-divers when referring to diving cylinders; however, this is a misnomer. These cylinders typically contain (compressed atmospheric) breathing air, or an oxygen-enriched air mix. They rarely contain pure oxygen, except when used for rebreather diving, shallow decompression stops in technical diving or for in-water oxygen recompression therapy. Breathing pure oxygen at depths greater than 6 metres (20 ft), equivalent to a partial pressure of oxygen of 1.6 bars (1.6 atm), can result in oxygen toxicity, a highly dangerous condition that can trigger seizures and thus lead to drowning. Diving cylinders have also been referred to as bottles or flasks, usually with one of the epithets scuba, diving, or bailout. Cylinders may also be called aqualungs, a genericized trademark derived from the Aqua-lung equipment made by the Aqua Lung/La Spirotechnique company, although that is more properly applied to an open circuit scuba set or open circuit diving regulator. An especially common cylinder provided at tropical dive resorts is the "aluminium-S80" which is an aluminium cylinder design with an internal volume of 0.39 cubic feet (11.0 L) rated to hold a nominal volume of 80 cubic feet (2,300 L) of atmospheric pressure gas at its rated working pressure of 3,000 pounds per square inch (207 bar). Aluminium cylinders are also often used where divers carry many cylinders, such as in technical diving in water which is warm enough that the dive suit does not provide much buoyancy, because the greater buoyancy of aluminium cylinders reduces the amount of extra buoyancy the diver would need to achieve neutral buoyancy. They are also sometimes preferred when carried as "sidemount" or "sling" cylinders as the near neutral buoyancy allows them to hang comfortably along the sides of the diver's body, without disturbing trim, and they can be handed off to another diver or stage dropped with a minimal effect on buoyancy. Most aluminium cylinders are flat bottomed, allowing then to stand upright on a level surface, but some were manufactured with domed bottoms. The aluminium alloys used for diving cylinders are 6061 and 6351. 6351 alloy is subject to sustained load cracking and cylinders manufactured of this alloy should be periodically eddy current tested according to national legislation and manufacturer's recommendations. 6351 alloy has been superseded for new manufacture, but many old cylinders are still in service. Taper thread (17E), with a 12% taper right hand thread, standard Whitworth 55° form with a pitch of 14 threads per inch (5.5 threads per cm) and pitch diameter at the top thread of the cylinder of 18.036 millimetres (0.71 in). These connections are sealed using thread tape and torqued to between 120 and 150 newton metres (89 and 111 lbf·ft) on steel cylinders, and between 75 and 140 N·m (55 and 103 lbf·ft) on aluminium cylinders. 3/4"x16 UNF, sealed by an O-ring, torqued to 40 to 50 N·m (30 to 37 lbf·ft) on aluminium cylinders. The purpose of the cylinder valve or pillar valve is to control gas flow to and from the pressure vessel and to provide a connection with the regulator or filling hose. Cylinder valves are usually machined from brass and finished by a protective and decorative layer of chrome-plating. A metal or plastic dip tube or valve snorkel screwed into the bottom of the valve extends into the cylinder to reduce the risk of liquid or particulate contaminants in the cylinder getting into the gas passages when the cylinder is inverted, and blocking or jamming the regulator. Some of these dip tubes have a plain opening, but some have an integral filter. Cylinder valves are classified by four basic aspects: The cylinder thread specification, the connection to the regulator, pressure rating, and other distinguishing features. Cylinder threads may be in two basic configurations: Taper thread and parallel thread. These thread specifications are detailed in a previous section. The valve thread specification must exactly match the neck thread specification of the cylinder. Improperly matched neck threads can fail under pressure and can have fatal consequences if someone is hit by the flying valve or cylinder. 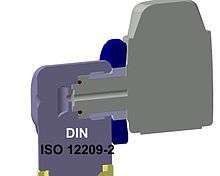 Adaptors are available to allow connection of DIN regulators to yoke cylinder valves (A-clamp or yoke adaptor), and to connect yoke regulators to DIN cylinder valves. (plug adaptors and block adaptors) Plug adaptors are rated for 232/240 bar, and can only be used with valves which are designed to accept them. Block adaptors are generally rated for 200 bar, and can be used with almost any 200 bar DIN valve. 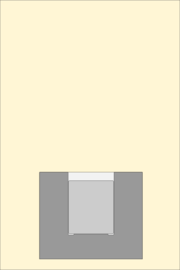 Reserve lever or "J-valve". 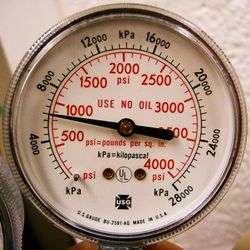 Until the 1970s, when submersible pressure gauges on regulators came into common use, diving cylinders often used a mechanical reserve mechanism to indicate to the diver that the cylinder was nearly empty. The gas supply was automatically cut-off by a spring loaded valve when the gas pressure reached the reserve pressure. To release the reserve, the diver pulled down on a rod that ran along the side of the cylinder and which activated a lever to open a bypass valve. The diver would then finish the dive before the reserve (typically 300 pounds per square inch (21 bar)) was consumed. On occasion, divers would inadvertently trigger the mechanism while donning gear or performing a movement underwater and, not realizing that the reserve had already been accessed, could find themselves out of air at depth with no warning whatsoever. The J-valve got its name from being item "J" in one of the first scuba equipment manufacturer catalogs. 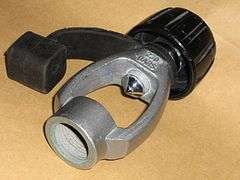 The standard non-reserve yoke valve at the time was item "K", and is often still referred to as a K-valve. J-valves are still occasionally used by professional divers in zero visibility, where the submersible pressure gauge (SPG) can not be read. 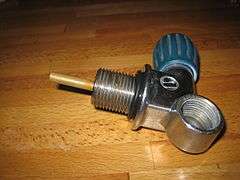 While the recreational diving industry has largely discontinued support and sales of the J-valve, the US Department of Defense, the US Navy, NOAA (the National Oceanographic and Atmospheric Administration) and OSHA (the national Occupational Health and Safety Administration) all still allow or recommend the use of J-valves as an alternative to a bailout cylinder or as an alternative to a submersible pressure gauge. They are generally not available through recreational dive shops, but are still available from some manufacturers. They can be significantly more expensive than K-valves from the same manufacturer. Less common in the 1950s to 1970s was an R-valve which was equipped with a restriction that caused breathing to become difficult as the cylinder neared exhaustion, but that would allow less restricted breathing if the diver began to ascend and the ambient water pressure lessened, providing a larger pressure differential over the orifice. 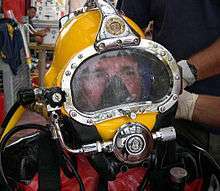 It was never particularly popular because, were it necessary for the diver to descend (as is often necessary in cave and wreck diving, breathing would become progressively more difficult as the diver went deeper, eventually becoming impossible until the diver could ascent to a low enough ambient pressure. Some cylinder valve models have axial spindles - in line with the cylinder axis, and are not handed. Standard side-spindle valves have the handwheel on the diver's right side when back-mounted. Side-spindle valves used with manifolds must be a handed pair - one with the handwheel to the right and the other with the handwheel to the left, but in all cases the valve is opened by turning the handwheel anticlockwise, and closed by turning it clockwise. This is the convention with almost all valves for all purposes. Left hand side-spindle valves are used by sidemount divers. Some national standards require that the cylinder valve includes a bursting disk, a pressure relief device that will release the gas before the cylinder fails in the event of overpressurization. If a bursting disk ruptures during a dive the entire contents of the cylinder will be lost in a very short time. The risk of this happening to a correctly rated disc, in good condition, on a correctly filled cylinder is very low. 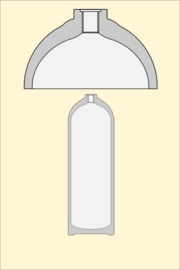 The oldest type is a tube with a connector on each end which is attached to the cylinder valve outlet, and an outlet connection in the middle, to which the regulator is attached. 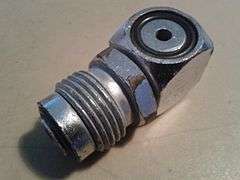 A variation on this pattern includes a reserve valve at the outlet connector. The cylinders are isolated from the manifold when closed, and the manifold can be attached or disconnected while the cylinders are pressurised. More recently, manifolds have become available which connect the cylinders on the cylinder side of the valve, leaving the outlet connection of the cylinder valve available for connection of a regulator. This means that the connection cannot be made or broken while the cylinders are pressurised, as there is no valve to isolate the manifold from the interior of the cylinder. 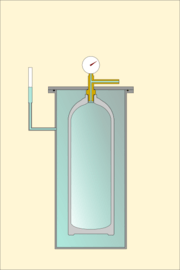 This apparent inconvenience allows a regulator to be connected to each cylinder, and isolated from the internal pressure independently, which allows a malfunctioning regulator on one cylinder to be isolated while still allowing the regulator on the other cylinder access to all the gas in both cylinders. These manifolds may be plain or may include an isolation valve in the manifold, which allows the contents of the cylinders to be isolated from each other. 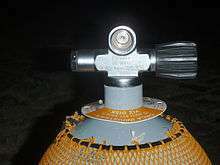 This allows the contents of one cylinder to be isolated and secured for the diver if a leak at the cylinder neck thread, manifold connection, or burst disk on the other cylinder causes its contents to be lost. A relatively uncommon manifold system is a connection which screws directly into the neck threads of both cylinders, and has a single valve to release gas to a connector for a regulator. These manifolds can include a reserve valve, either in the main valve or at one cylinder. This system is mainly of historical interest. Also known as a manifold cage or regulator cage, this is a structure which can be clamped to the neck or shoulder of the cylinder or manifolded cylinders to protect the valves and regulator first stages from impact and abrasion damage while in use and from rolling the valve closed by friction of the handwheel against an overhead. A valve cage is often made of stainless steel, and some designs can snag on obstructions. For example, common Aluminum 80 (Al80) cylinder is an aluminum cylinder which has a nominal 'free gas' capacity of 80 cubic feet (2,300 L) when pressurized to 3,000 pounds per square inch (210 bar). It has an internal volume of 10.94 litres (0.386 cu ft). 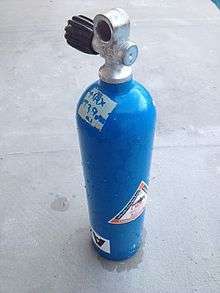 Aluminum S80 is probably the most ubiquitous cylinder, used by resorts in many parts of the world for back gas, but also popular as a sling cylinder for decompression gas, and as side-mount cylinder in fresh water, as it has nearly neutral buoyancy. These cylinders have an internal volume of approximately 11 litres (0.39 cu ft) and working pressure of 3,000 pounds per square inch (207 bar). They are also sometimes used as manifolded twins for back mount, but in this application the diver needs more ballast weights than with most steel cylinders of equivalent capacity. The pony is typically a 2 to 5 litre cylinder. Its capacity determines the depth of dive and decompression duration for which it provides protection. Ponies may be fixed to the diver's buoyancy compensator (BC) or main cylinder behind the diver's back, or can be clipped to the harness at the diver's side or chest or carried as a sling cylinder. Ponies provide an accepted and reliable emergency gas supply but require that the diver is trained to use them. Two 3 litre, 232 bar, DIN valved cylinders inside an Inspiration electronically controlled closed circuit diving rebreather. Diving bells are required to carry an on-board supply of breathing gas for use in emergencies. The cylinders are mounted externally as there is insufficient space inside. They are fully immersed in the water during bell operations, and may be considered diving cylinders. In the US the capacity of a diving cylinder is specified directly in cubic feet of free air at the nominal working pressure, as the calculation from internal volume and working pressure is relatively tedious in imperial units. For examle, in the US and in many diving resorts in other countries, one might find aluminum cylinders of US manufacture with an internal capacity of 0.39 cubic feet (11 L) filled to a working pressure of 3,000 psi (210 bar); Taking atmospheric pressure as 14.7 psi, this gives 0.39 × 3000 / 14.7 = 80 ft³ These cylinders are described as "80 cubic foot cylinders", (the common "aluminum 80"). Up to about 200 bar the ideal gas law remains valid and the relationship between the pressure, size of the cylinder and gas contained in the cylinder is linear; at higher pressures there is proportionally less gas in the cylinder. A 3-litre cylinder filled to 300 bar will only carry contain 810 litres (29 cu ft) of atmospheric pressure gas and not the 900 litres (32 cu ft) expected from the ideal gas law. A diver with a RMV of 40 L/min at 50 msw (6 bar) for 10 minutes will consume 40 x 6 x 10 = 2400 litres of free air – the full capacity of a 12 litre 200 bar cylinder. Cylinder, valve and manifold weights will vary depending on model, so actual values will value accordingly. Contaminated air at depth can be fatal. Common contaminants are: carbon monoxide - a by-product of combustion, carbon dioxide - a product of metabolism, and oil and lubricants from the compressor. If a cylinder passes the listed procedures, but the condition remains doubtful, further tests can be applied to ensure that the cylinder id fit for use. Cylinders that fail the tests or inspection and cannot be fixed should be rendered unserviceable after notifying the owner of the reason for failure. Before any cylinder is filled, verification of inspection and testing dates and a visual examination for external damage and corrosion are required by law in some jurisdictions, and are prudent even if not legally required at other places. Inspection dates can be checked by looking at the visual inspection label and the hydrostatic test date is stamped on the shoulder of the cylinder. Before use the user should verify the contents of the cylinder and check the function of the cylinder valve. This is usually done with a regulator connected to control the flow. Pressure and gas mixture are critical information for the diver, and the valve should open freely without sticking or leaking from the spindle seals. Breathing gas bled from a cylinder may be checked for smell. If the gas does not smell right it should not be used. Breathing gas should be almost free of smell, though a very slight aroma of the compressor lubricant is fairly common. No smell of combustion products or volatile hydrocarbons should be discernible. Failure to recognize that the gas was not on or that cylinder was empty by divers conducting a pre-dive evaluation has been noted. Dive Instructor leg nearly amputated by ejected valve while attempting to remove valve from pressurised cylinder. Valve ejected during filling due to thread failure, sank dive boat. Bursting disks in cylinder valves replaced by solid bolts. Filling hose failure severely injured operator when hose hit his face. Wound exposed jaw bone. 14 stitches to close the wound. International Civil Aviation Organisation (ICAO) Technical Instructions for the Safe Transport of Dangerous Goods by Air states that provided that pressure in diving cylinders is less than 200 kilopascals (2 bar; 29 psi), these can be carried as checked in or carry-on baggage. It maybe necessary to empty the cylinder to verify this. Once emptied, the cylinder valve should be closed to prevent moisture entering the cylinder. Security restrictions implemented by individual countries may further limit or forbid the carriage of some items permitted by ICAO, and airlines and security screening agencies have the right to refuse the carriage of certain items. A steel 15 litre cylinder with net and boot and a bare 12 litre aluminium cylinder. 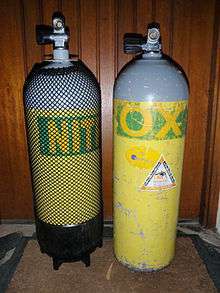 Both are labeled for Nitrox use. The aluninium cylinder also displays a triangular label specifying the date of the most recent internal inspection and an oval label recording the most recent neck thread eddy current test. The colours permitted for diving cylinders vary considerably by region, and to some extent by the gas mixture contained. In some parts of the world there is no legislation controlling the colour of diving cylinders. In other regions the colour of cylinders used for commercial diving, or for all underwater diving may be specified by national standards. Breathing gas containers for offshore use may be coded and marked according to IMCA D043. IMCA colour coding for individual cylinders allows the body of the cylinder to be any colour that is not likely to cause misinterpretation of the hazard identified by the colour code of the shoulder. ↑ This is a European requirement. ↑ This is a European requirement, a requirement of the US DOT, and a South African requirement. ↑ NOAA Diving Manual 2001, Section 3.3.3.3 Oxygen toxicity. ↑ Staff (2014). "Aqua Lung UK". Paris, France: Aqua Lung International. Retrieved 9 October 2015. 1 2 3 4 5 6 7 NOAA Diving Manual 2001, Section 5.7 Compressed gas cylinders. 1 2 Stone, WC (1986). "Design of fully redundant autonomous life support systems.". In: Mitchell, CT (eds.) Diving for Science 86. Proceedings of the American Academy of Underwater Sciences Sixth Annual Scientific Diving Symposium. Dauphin Island, Alabama: American Academy of Underwater Sciences. Retrieved 7 January 2016. ↑ Staff. "History of Stone Aerospace". Austin, Texas: Stone Aerospace. Retrieved 13 November 2016. ↑ "CFR Title 49: Transportation". §173.301b Additional general requirements for shipment of UN pressure receptacles. (g) Composite cylinders in underwater use. Washington, DC: US Department of Transport. Retrieved 21 January 2016. ↑ Staff. "Catalina aluminium cylinders" (PDF). Catalogue. Xscuba.com. Retrieved 25 December 2015. ↑ "Sustained-load cracking (SLC) in ruptured scuba cylinder made from 6351 aluminum alloy". Salford, Greater Manchester, UK: The Luxfer Group. 22 October 2007. Retrieved 9 October 2015. ↑ High, Bill (23 February 2005). "Cracking and Ruptures of SCBA and SCUBA Aluminum Cylinders Made from 6351 Alloy" (PDF). Honolulu: University of Hawai'i. Retrieved 9 October 2015. ↑ Staff (2015). "Manufacturing processes: All-aluminum cylinders". Salford, UK: Luxfer Gas Cylinders, Luxfer Holdings PLC. Retrieved 25 December 2015. ↑ Staff (19 October 2006). "A Consumer's Guide to Scuba Tanks". scubadiving.com. Winter Park, Florida: Scuba Diving. A Bonnier Corporation Company. Retrieved 6 January 2016. ↑ webStaff. "About Faber High Pressure Steel Tank". Leisurepro diver emporium,. Retrieved 6 January 2016. 1 2 Staff. "12L Concave Euro Cylinder with Left or Right Hand Valve". DirDirect Worldwide product catalog. Portland, UK: Underwater Explorers Ltd. Retrieved 16 January 2016. 1 2 3 4 5 Roberts, Fred M. (1963). Basic Scuba: Self contained underwater breathing apparatus: Its operation, maintenance and use (2nd ed.). New York: Van Nostrand Reinholdt. ↑ "49 CFR 178.37 - Specification 3AA and 3AAX seamless steel cylinders. (DOT 3AA)". Washington, DC: US Department of Transport – via Legal Information Institute. ↑ Worthington steel. "Making a Worthington X-Series Steel Scuba Cylinder". ↑ Technical Committee 58 Gas cylinders (25 March 1999). ISO 11116-1: Gas cylinders - 17E taper thread for connection of valves to gas cylinders (First ed.). Geneva, Switzerland: International Standards Organization. 1 2 3 Technical Committee ISO/TC 58, Gas cylinders. (15 October 1997). ISO 13341:1997 Transportable gas cylinders - Fitting of valves to gas cylinders (1st ed.). Geneva, Switzerland: International Standards Organisation. 1 2 Staff. "Valving of SCUBA (Air) Cylinders". Support documents. Garden Grove, California: Catalina Cylinders. Retrieved 13 November 2016. ↑ Staff. "Luxfer Limited 106". Catalog. XS Scuba. Retrieved 7 August 2016. ↑ Staff (2016). "Advanced Open Water Diver Course - Standard Scuba Tank Features". Rancho Santa Margarita, California: PADI. Retrieved 16 January 2016. 1 2 3 Harlow, Vance (1999). Scuba regulator maintenance and repair. Warner, New Hampshire: Airspeed press. ISBN 0 9678873 0 5. 1 2 Barsky, Steven; Neuman, Tom (2003). Investigating Recreational and Commercial Diving Accidents. Santa Barbara, California: Hammerhead Press. ISBN 0-9674305-3-4. 1 2 3 4 5 6 Harlow, Vance (2001). Oxygen Hacker's Companion (4th ed.). Warner, New Hampshire: Airspeed Press. ↑ Compressed Gas Association (1990). Handbook of Compressed Gases (3rd ed.). New York City: Chapman and Hall. p. 229. ISBN 978-1-4612-8020-0. Retrieved 17 January 2016. ↑ Staff. "Valves and Neck Threads - Regulator Fittings and SCUBA Valves". Pompano Beach, Florida: Dive Gear Express, LLC. Retrieved 16 January 2016. 1 2 3 4 Staff. "How to select a SCUBA tank". www.divegearexpress.com. Pompano Beach, Florida: Dive Gear Express, LLC. Retrieved 8 November 2016. ↑ Staff (August 1999). "DrägerRay Mixed Gas-Rebreather Instructions for Use" (PDF). 90 21 365 - GA 2215.000 de/en (2nd ed.). Lübeck, Germany: Dräger Sicherheitstechnik GmbH. pp. 46–88. Retrieved 8 November 2016. 1 2 3 4 Staff. "San-o-Sub DIN/K Cylinder Valve - 232 bar". Melbourne, Victoria: The Scuba Doctor. Retrieved 6 January 2016. ↑ Dowding, Scott (2003). The Recreational Diver's Dictionary & Historical Timeline. Bloomington, Indiana: iUniverse. ISBN 9780595294688. 1 2 3 4 US Navy Diving Manual 2006, Section 7-2.2 Open circuit scuba. ↑ Staff. "Apeks Left and Right hand Cylinder Valve". Products. Blackburn, United Kingdom: Apeks Marine Equipment. Retrieved 16 January 2016. 1 2 3 4 5 6 Gilliam, Bret C; Von Maier, Robert; Crea, John (1992). Deep diving: an advanced guide to physiology, procedures and systems. San Diego, California: Watersport Publishing, Inc. ISBN 0-922769-30-3. Retrieved 10 January 2016. 1 2 3 4 5 NOAA Diving Manual 2001, Section 5.5 Compressed air. 1 2 Jackson, Jack (2005). Complete Diving Manual. London: New Holland. ISBN 1-84330-870-3. 1 2 3 Hendrick W, Zaferes A, Nelson C (2000). Public Safety Diving. Tulsa, Oklahoma: PennWell Books. ISBN 0912212942. Retrieved 11 January 2016. ↑ Staff. "DIN Valve Cover Plug - Machined Delrin". Melbourne, Victoria: The Scuba Doctor. Retrieved 21 January 2016. 1 2 3 4 5 6 7 8 9 10 11 12 13 14 15 16 South African National Standard SANS 10019:2008 Transportable containers for compressed, dissolved and liquefied gases - Basic design, manufacture, use and maintenance (6th ed.). Pretoria, South Africa: Standards South Africa. 2008. ISBN 978-0-626-19228-0. 1 2 3 4 5 Staff. "Faber cylinders for Scuba Diving". Calalog page for 15 to 22 litre steel cylinders. Cividale del Friuli, Italy: Faber Industrie S.p.A. Retrieved 31 January 2016. 1 2 Staff. "Faber cylinders for Scuba Diving". Calalog page for 12 to 14.5 litre steel cylinders. Cividale del Friuli, Italy: Faber Industrie S.p.A. Retrieved 31 January 2016. ↑ Staff. "Faber cylinders for Scuba Diving". Calalog page for 9.5 to 11,9 litre steel cylinders. Cividale del Friuli, Italy: Faber Industrie S.p.A. Retrieved 31 January 2016. 1 2 Staff. "Faber cylinders for Scuba Diving". Calalog page for 6 litre to 9.5 litre steel cylinders. Cividale del Friuli, Italy: Faber Industrie S.p.A. Retrieved 31 January 2016. 1 2 3 4 5 6 Staff. "Faber cylinders for Scuba Diving". Calalog page for 1 litre to 5.5 litre steel cylinders. Cividale del Friuli, Italy: Faber Industrie S.p.A. Retrieved 31 January 2016. 1 2 3 4 5 Staff. "Scuba specifications" (PDF). Garden Grove, California: Catalina Cylinders Inc. Retrieved 31 January 2016. ↑ Staff (2013). "Worthington steel cylinder specifications". XS Scuba. Archived from the original on 17 August 2013. Retrieved 8 November 2016. ↑ US Navy Diving Manual 2006, Section 14-2.5 Emergency gas supply. 1 2 3 4 Beresford, M; Southwood, P (2006). CMAS-ISA Normoxic Trimix Manual (4th ed.). Pretoria, South Africa: CMAS Instructors South Africa. 1 2 NOAA Diving Manual 2001, Section 5.4 Emergency gas supply. 1 2 Lang, M.A. and M.D.J. Sayer (eds.) (2007). Proceedings of the International Polar Diving Workshop. Svalbard: Smithsonian Institution. ↑ "Spare Air". Huntington Beach, California: Submersible Systems. 7 July 2009. Retrieved 19 September 2009. 1 2 Austin, Doug. "Extended endurance saturation diving emergency bailout system" (PDF). Divex. pp. 6–9. Retrieved 6 January 2016. ↑ Bogaert, Steve (5 May 2011). "Multi Stage Dive by Steve Bogaerts with the new Razor Side Mount System". Retrieved 6 January 2016. 1 2 Staff (19 October 2006). "Are you ready for rebreathers?". Scuba Diving online magazine. Winter Park, Florida: Scuba Diving. A Bonnier Corporation Company. Retrieved 6 January 2016. 1 2 3 Verdier, C; Lee, DA (2008). "Motor skills learning and current bailout procedures in recreational rebreather diving.". In: Verdier (ed). Nitrox Rebreather Diving. DIRrebreather publishing. Retrieved 7 January 2016. ↑ US Navy Diving Manual 2006, Chapter 8 Surface supplied air diving operations. 1 2 3 "Diving Regulations 2009". Occupational Health and Safety Act 85 of 1993 - Regulations and Notices - Government Notice R41. Pretoria: Government Printer. Retrieved 3 November 2016 – via Southern African Legal Information Institute. 1 2 3 Staff (2002). Paul Williams, ed. The Diving Supervisor's Manual (IMCA D 022 May 2000, incorporating the May 2002 erratum ed.). London, UK: International Marine Contractors' Association. ISBN 1-903513-00-6. ↑ Staff. "Products:A.P.VALVES MK4 JUMP JACKET". Bergen op Zoom, Netherlands: Pommec diving equipment. Retrieved 6 January 2016. ↑ Staff (February 2014). 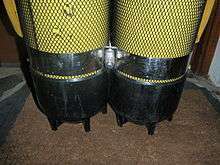 "4.7.5 Emergency breathing gas cylinders for diving basket/wet bell". IMCA D014 International Code of Practice for Offshore Diving (PDF) (Revision 2 ed.). London, UK: International Marine Contractors Association. p. 19. Retrieved 30 January 2016. ↑ Staff (July 2014). 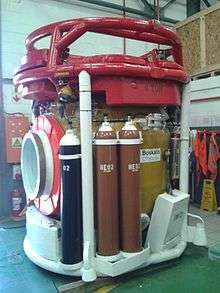 "Section 5 - Diving Bell: 5.23 - Onboard gas, and 5.24 - Onboard oxygen". IMCA D024 Rev 2 - Part 2 DESIGN for Saturation (Bell) Diving Systems (PDF) (Revision 2 ed.). London, UK: International Marine Contractors Association. pp. 4 of 10. Retrieved 30 January 2016. ↑ Buzzacott P, Rosenberg M, Heyworth J, Pikora T (2011). "Risk factors for running low on gas in recreational divers in Western Australia". Diving and Hyperbaric Medicine. Melbourne, Victoria: SPUMS and EUBS. 41 (2): 85–9. PMID 21848111. Retrieved 7 January 2016. ↑ NOAA Diving Manual 2001, Section 3.2 Respiration and circulation. ↑ British Sub-Aqua Club members (1982). British Sub-Aqua Club Diving Manual (10th ed.). Ellesmere Port, Cheshire: British Sub-Aqua Club. p. 567. ISBN 0950678619. 1 2 3 NOAA Diving Manual 2001, Section 8.5 Air consumption rates. ↑ NOAA Diving Manual 2001, Section 2.1 Pressure. ↑ Bozanic, JE (1997). Norton, SF, ed. "AAUS Standards for Scientific Diving Operations in Cave and Cavern Environments: A Proposal.". Diving for Science...1997. Proceedings of the American Academy of Underwater Sciences. Dauphin Island, Alabama: AAUS (17th Annual Scientific Diving Symposium). Retrieved 7 January 2016. ↑ Sheldrake, S; Pedersen, R; Schulze, C; Donohue, S; Humphrey, A (2011). "Use of Tethered Scuba for Scientific Diving". In: Pollock NW, ed. Diving for Science 2011. Proceedings of the American Academy of Underwater Sciences 30th Symposium. Dauphin Island, Alabama: AAUS. Retrieved 9 January 2016. ↑ Technical Committee 20 - Aircraft and space vehicles (1 May 1975). ISO 2533:1975 Standard Atmosphere. Geneva, Switzerland: International Standards Organisation. ↑ "Cylinders". Gas Diving UK. 26 January 2003. Retrieved 9 October 2015. 1 2 3 Millar, IL; Mouldey, PG (2008). "Compressed breathing air – the potential for evil from within". Diving and Hyperbaric Medicine. Melbourne, Victoria: South Pacific Underwater Medicine Society. 38 (2): 145–51. PMID 22692708. Retrieved 28 February 2009. 1 2 Calhoun, Fred. "The case for dry-filling scuba tanks" (PDF). The best of Sources: Equipment. pp. 146–149. Retrieved 8 November 2016. ↑ Trigger, John (April 1999). "High Pressure Rusting: a Problem with High Pressure Steel Tanks?". Undercurrent. Sausalito, California: Undercurrent (www.undercurrent.org). Retrieved 16 January 2016. ↑ NOAA Diving Manual 2001, Section 5.6 Air compressors and filtering systems. 1 2 Staff. "Scuba Cylinder Servicing and High Pressure Valve Support Pages". ScubaEngineer.com. Retrieved 16 January 2016. ↑ ISO 6406 2005, Section 3. ↑ ISO 10461 2005, Section 3. ↑ Henderson, NC; Berry, WE; Eiber, RJ; Frink, DW (1970). "Investigation of scuba cylinder corrosion, Phase 1". National Underwater Accident Data Center Technical Report Number 1. Kingston, Rhode Island: University of Rhode Island. Retrieved 24 September 2011. ↑ BS EN 1802:2002 Transportable gas cylinders. Periodic inspection and testing of seamless aluminium alloy gas cylinders. London: British Standards Institution. 25 March 2002. ISBN 0 580 39412 3. ↑ Committee PVE/3/7 (25 March 2002). BS EN 1968:2002 Transportable gas cylinders. Periodic inspection and testing of seamless steel gas cylinders. London: British Standards Institution. ISBN 0 580 39413 1. ↑ Staff (1999). AS 2030.1—1999 Australian Standard: The verification, filling, inspection, testing and maintenance of cylinders for storage and transport of compressed gases. Part 1: Cylinders for compressed gases other than acetylene. Reissued incorporating Amendment No. 1 (March 2002) (Third ed.). Sydney, New South Wales: Standards Australia International Ltd. ISBN 0-7337-2574-0. ↑ ISO 6406 2005, Section 4. ↑ ISO 10461 2005, Section 4. ↑ ISO 6406 2005, Section 5. ↑ ISO 10461 2005, Section 5. ↑ ISO 6406 2005, Section 6. ↑ ISO 10461 2005, Section 6. ↑ ISO 10461 2005, Section 7.1. ↑ ISO 6406 2005, Section 7.2. ↑ ISO 10461 2005, Section 7.2. ↑ ISO 6406 2005, Section 8. ↑ ISO 10461 2005, Section 8. ↑ ISO 6406 2005, Section 9. ↑ ISO 6406 2005, Section 10. ↑ ISO 10461 2005, Section 10. ↑ ISO 6406 2005, Section 11. ↑ ISO 10461 2005, Section 11. ↑ ISO 6406 2005, Section 12. ↑ ISO 10461 2005, Section 12. ↑ ISO 6406 2005, Section 15.2. ↑ ISO 6406 2005, Section 15.4. ↑ ISO 10461 2005, Section 14.5. ↑ ISO 6406 2005, Section 15.7. ↑ ISO 10461 2005, Section 14.8. ↑ ISO 10461 2005, Section 15. ↑ Acott, CJ (1995). "A pre-dive check; An evaluation of a safety procedure in recreational diving: Part 1.". Journal of the South Pacific Underwater Medicine Society. Melbourne, Victoria: SPUMS. 25 (2). Retrieved 7 January 2016. ↑ Staff (Summer 2014). "Incident Insights - Trust But Verify". Alert Diver. Retrieved 13 November 2016. ↑ Denoble PJ, Caruso JL, Dear Gde L, Pieper CF, Vann RD (2008). "Common causes of open-circuit recreational diving fatalities". Undersea & Hyperbaric Medicine : Journal of the Undersea and Hyperbaric Medical Society, Inc. Bethesda, Maryland. 35 (6): 393–406. PMID 19175195. Retrieved 7 January 2016. ↑ Acott, CJ (2003). "Recreational scuba diving equipment problems, morbidity and mortality: an overview of the Diving Incident Monitoring Study and Project Stickybeak.". Journal of the South Pacific Underwater Medicine Society. Melbourne, Victoria: SPUMS. 33 (1). Retrieved 7 January 2016. ↑ Barr, Lori L; Martin, Larry R (1991). "Tank carrier's lateral epicondylitis: Case reports and a new cause for an old entity". Journal of the South Pacific Underwater Medicine Society. Melbourne, Victoria: SPUMS. 21 (1). Retrieved 21 November 2011. ↑ US Navy Diving Manual 2006, Section 7-4.5 Safety precautions for charging and handling cylinders. ↑ US Navy Diving Manual 2006. 1 2 3 DGM_Support (16 April 2014). "How to select the correct Proper Shipping Name?". Hoofddorp, The Netherlands: Dangerous Goods Management Group. Retrieved 31 January 2016. ↑ Staff (8 January 2010). "§ 172.101 HAZARDOUS MATERIALS TABLE". 49 CFR Ch. I Subpart B -Table of Hazardous Materials and Special Provisions (PDF). Washington, DC: Pipeline and Hazardous Materials Safety Admin. DOT. pp. 134, 207, 249. Retrieved 31 January 2016. 1 2 3 4 5 6 Economic Commission for Europe Committee on Inland Transport (2014). European Agreement Concerning the International Carriage of Dangerous Goods by Road (ADR) (PDF). New York and Geneva: United Nations. ISBN 978-92-1-056691-9. Retrieved 31 January 2016. ↑ Staff (2015). "Packing Instruction 200, Table 1: Compressed gases". Recommendations on the TRANSPORT OF DANGEROUS GOODS Model Regulations (PDF). II (Nineteenth revised ed.). New York and Geneva: United Nations. p. 44. Retrieved 2 February 2016. ↑ Staff. "Items that are allowed in baggage: Information for Passengers on Dangerous Goods". London: Civil Aviation Authority. Retrieved 2 February 2016. 1 2 3 4 5 6 7 8 Guidance note 27: Guidance for the carriage of gas cylinders on vehicles (Revision 1 ed.). Derby, UK: British Compressed Gases Association. 2015. ISSN 0260-4809. ↑ Staff (2015). "The carriage of small quantities of gas cylinders on vehicles". Leaflet 1: Revision 5. Derby, UK: British Compressed Gases Association. Retrieved 31 January 2016. ↑ DOT (January 2016). "§171.1 Applicability of Hazardous Materials Regulations (HMR) to persons and functions.". Electronic Code of Federal Regulations, Title 49 - Transportation. Washington, DC: US Department of Transport. Retrieved 2 February 2016. 1 2 US Department of Transport (20 January 2016). "Part 173—Shippers—General Requirements For Shipments and Packagings". Code of Federal Regulations Title 49 - Transportation. Washington, DC: US Government publishing office. Retrieved 23 January 2016. ↑ US Department of Transport. "Code of Federal Regulations 49 - Transportation". 49 CFR 173.115 - Class 2, Divisions 2.1, 2.2, and 2.3. Ithaca, New York: Cornell University Law School Legal Information Institute. Retrieved 21 January 2016. ↑ PHMSA staff. "Special Permits list". Washington, DC: Pipeline and Hazardous Materials Safety Administration. Retrieved 23 January 2016. ↑ Monahan, Corey (1 July 2011). "Cylinders are HAZMAT?". Retrieved 21 January 2016. ↑ Staff (19 March 2013). "Pack Safe: Scuba tanks, pressurized". Washington, DC: Federal Aviation Administration. Retrieved 21 January 2016. ↑ Staff. "My TSA". Search results for Scuba cylinder. Transportation Security. Retrieved 21 January 2016. 1 2 3 Staff (2012). "Cylinder Identification. Colour Coding and Labelling Requirements.". Technical Information Sheet 6 Revision 2. 4a Mallard Way, Pride Park, Derby, UK, DE24 8GX. 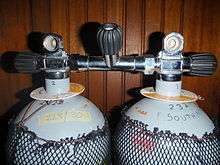 : British Compressed Gases Association. Retrieved 8 November 2016. 1 2 Staff (2007). Marking and Colour Coding of Gas Cylinders, Quads and Banks for Diving Applications IMCA D043 (PDF). London, UK: International Marine Contractors Association. Retrieved 1 February 2016.